Beans or legumes have been around since the dawn of man. Early man found bean pods and starting eating them… noticing they could thrive on these wonderful packets of nutrition. Some beans don’t contain all needed proteins, but when combined with brown rice, seeds, nuts, corn and other grains they become a full spectrum protein… but some beans like soybeans do contain all the essential amino acids. And beans have many health benefits that tend to be overlooked. Lower Cholesterol – Beans have lots of great soluble and non soluble fiber that help lower cholesterol and triglycerides thus preventing heart disease, strokes, and cancer. Beans lower LDL or bad cholesterol. Lower Blood Pressure – Because beans don’t contain fats that are found in other types of protein like animal products, beans can lower your blood pressure. And they don’t cause the inflammation associated with animal protein that produces high blood pressure. And studies show that people who eat beans on a regular basis have lower blood pressure. High in Antioxidants – Beans have lots of antioxidants, and kidney beans have more antioxidants than blueberries. – It’s true! This means beans can boost your immune system and help prevent diseases such as auto-immune disease, colds, flues, cancer and more. Lots of Great Fiber – Beans contain 9 to 12 grams of fiber per serving – that’s a lot of fiber. And fiber is needed for creating a good environment for colon health. Colon Health – Beans have lots of wonderful fiber that boost your immune system by creating a place for probiotic bacteria to grow. Thus keeping good bacteria working to keep you healthy and preventing bad bacteria from taking over and creating disease. Good colon health = good health… and eating beans can reduce the risk of colon and rectal cancer. Cancer – Beans contain protease inhibitor enzymes that prevent cancer. Thus eating beans on a regular basis is very important for cancer prevention. Beans contain phytonutrients such as coumestrol, cinnamic acid, and secoisolariciresinol which all help to prevent cancer. And eating beans at least 2 to 4 times a week can lower your risk of breast and prostate cancer by almost 25%. – Great! Heart Disease – A study at Tulane University shows that eating 4 servings of beans a week lowered the incidents of heart disease by more than 20%. Plus beans have lots of potassium and magnesium that help relax blood vessels and thus lower blood pressure… and help with water regulation too. And soybeans contain Nattokinase which actually can open up clogged arteries just as well as some of the enzymes that doctors use for heart attacks. And beans lower homocysteine levels thus lowering inflammation… thus preventing heart attacks. And beans contain phytonutrients (These nutrients are also found in chocolate, berries, and wine) that prevent the clumping together of platelets in the blood thus preventing heart attacks. Stabilize Blood Sugar – Studies with beans show the more beans you eat the easier it is to control your blood sugar. Beans stabilize your blood sugar because beans have a low glycemic index, that means they break down into sugar very slowly… and making them wonderful food for weight loss and diabetics. And because beans lower blood pressure, it means prevent renal disease, because high blood pressure is one of the leading causes of kidney failure. A study was done with wheat bran and beans, two different groups, at the end of the study it was found that wheat bran lowered cholesterol and blood sugar. But the group that ate beans lowered blood sugar, cholesterol, and also lowered blood pressure too! That was an unexpected result making beans very important for health… especially for diabetics. Sustained Energy – Beans have good carbs that give you lots of energy over long periods of time. Allergies and Food Intolerances – People who eat beans have a much lower incidence of food allergies and food intolerances… and beans can help with gluten intolerance too. Constipation – Because beans contain lots of fiber which is not soluble it provides bulk that allows food and waste to move through your digestive system correctly. People who eat beans weekly are rarely constipated. Weight Loss – Beans are a low glycemic index food with lots of fiber that fills you up so you don’t get hungry. And meat breaks down quickly in the GI tract while beans take a long time to break down so you don’t get as hungry… thus you lose weight. Hemorrhoids – The more fiber you have in your diet the less straining you have to do to in order to defecate and that means fewer problems with rectal hemorrhoids. Isoflavones – Beans contain lots of isoflavones which are similar to estrogen that help to prevent heart disease, menopause symptoms, and prevent prostate cancer. Beans Contain – Beans have lots of B-Vitamins, potassium for heart health, magnesium for lowering blood pressure, zinc for boosting your immune system, copper and iron for preventing anemia, tryptophan for helping you to fall asleep, protein for muscles and enzymes, phosphorus for strong bones, molybdenum for preventing gastroesophageal cancer, and manganese for preventing osteoporosis, and they are cholesterol free, and almost totally fat free… but do contain some good fatty acids that help to prevent cancer and heart disease. 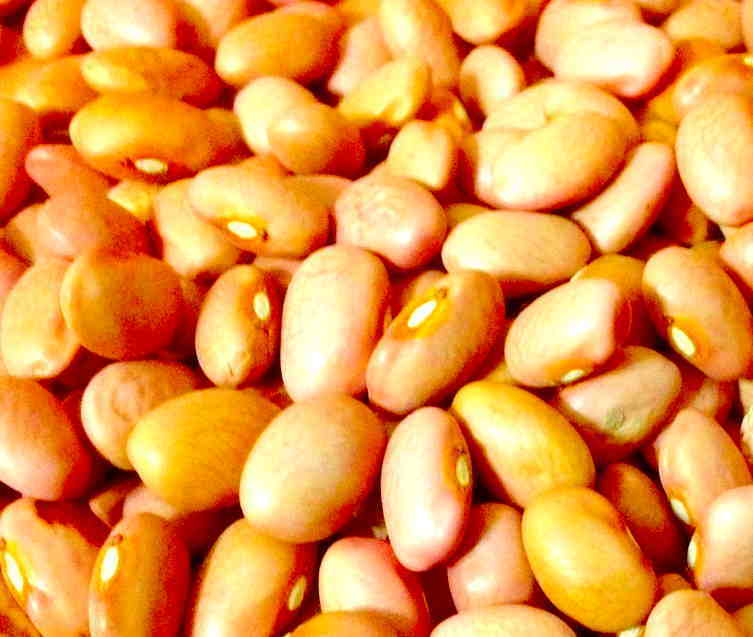 Lots of Different Types of Beans – There are lots of different types of beans including garbanzo, great northern, Italian, kidney, lima, mung, navy, white, split peas, edamame, lentils, cannellini, calico, butter, fava, adzuki, black-eyed peas, soy, pintos, black beans and more. And they can be made into soups, stews, veggie meat, spreads, used in salads, in main dishes, in casseroles, and more – use your imagination the skies the limit. What About Gas – If you tend to become gassy with beans then sprout them and that won’t happen. Add sprouted beans to soups, stews, and more just like regular beans. And there are lots of natural enzymes you can buy at the drug store that prevent gas from beans. And once you build up good bacteria in your gut, the less gas you have. Myth – Some people think of beans are for poor people, but during times of war when meat was hard to come by… people ate beans and became health. It seems we should all be eating beans… and living longer healthier lives. I think I’ll go cook up some beans right now! This entry was posted in Healing Herbs and tagged Abntoixidants, Allergies, Beans, blood sugar levels, boosting your immune system, Colon Health, constipation, Diabetes, Energy, Food Intolerances, Great Fiber, Health, health food store, healthy-living, Hemorrhoids, Isoflavones, lower blood pressure, lower cholesterol, Master Herbalist, Myths, Natural, nature, plants, prevent cancer, Prevent Heart Disease, Stabilize Blood Sugar, Stop Disease, vegetarian, Weight Loss. Bookmark the permalink.